NEDA, National Egyptian Development Association. Education Training Activities. Cairo, Egypt. NEDA, National Egyptian Development Association, is an Egyptian national foundation Non Profit Organizations registered under # 6552 with the Ministry of Social Solidarity and governed by law 84/2002. NEDA was established in 2006 by a group of an intellectuals and businessmen/ women with the purpose of qualifying youth to fit the requirements of the job market within the framework of maximizing and enhancing the role of civil society to contribute to the development of the Egyptian society and address its priority socio-economic issues – particularly unemployment with all its negative impacts on society. The experience of NEDA's members and their business partners has shown that Egypt is suffering from a severe labor problem reflected in the absence of the adequate experience and qualifications needed to support national economic entities in facing challenges of globalization, open markets, exporting and the exposure of domestic market to foreign imports. This challenging period in the history of Egypt requires a highly qualified labor force that is conscious of the job market, work ethics, quality measures and competition rules, besides new technologies, crafts and trade. The government, international organizations, some private businesses as well as civil society organizations all have a role in addressing this issue. 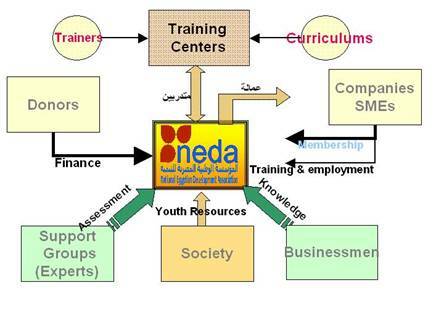 NEDA and its partners consciously exercise Corporate Social Responsibility "CSR" and commitment towards their internal environment (including but not limited to anti-corruption, right to association and healthy work environment) as well as their external surrounding environment (including but not limited to improving youth skills and employment). Qualifying youth to a distinguished level to fit the requirements of the job market through scientific efforts and cost effective methodologies that guarantee best results within a short timeframe. NEDA decided to start in Greater Cairo, in order to gain experience and establish a successful module to be replicated in the future and at the same time open communication channels with donors, training organizations as well as companies and organizations in need of qualified labor. However, in the future it hopes to reach the whole of Egypt. Businessmen and companies' participation in the process as partners and end- beneficiaries of youth development. Contribution of experts and specialists through sub-committees that support the whole process: research, networking, fundraising, awareness building, training, information technology and employment. Conducting activities based on scientific methods and up-to-date data bases and reports to ensure quality performance. Reliance on qualified trainers and training centers based on cost effective methodologies rather than establishing new facilities for saving time and costs. Managing the association through modern management and technical methods to assure quality and proper communication with donors. Training and supporting 50 young people from Shoubra el Kheima to find suitable work opportunities. The overall target in the area is 200 youth. NEDA's Organizational Structure. A Model for Non Profit Organization. Electronic Mail: dinaraouf@yahoo.com PLEASE Copy and Paste. NEDA is a member of Professional Memberships in Egypt (and abroad).